Manufactured by Manville, 1936, originally a police riot control device for launching up to 18 27-mm tear gas canisters without reloading. 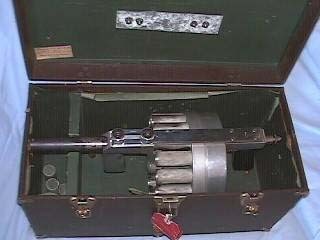 This item is in it's original carrying box and would fire	(if you were to chance destroying the aluminum mechanism) the currently produced H&K flare rounds. Until 1985, a variety of European made military rounds were still floating around but have gotten terribly scarce, as you can imagine. 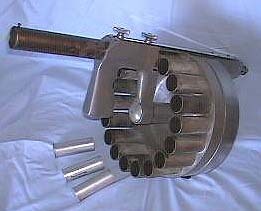 "Dirty Dave's", which I	believe was in California, used to carry casings for the device from various sources.